Michał Paluta (CCC Sprandi Polkowice) won stage 2 of 2016 Carpathian Couriers Race and assumed the overall lead of the race. 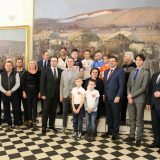 Polish U23 road race champion proved the fastest in a sprint from a reduced bunch into Stara Bystrica, Slovakia, narrowly edging LKT Brandenburg’s duo – Leon Rohde and Max Kanter – and riding himself into the overall lead. Paluta leads the race into last two stages in Poland and has a 3 seconds advantage over Stephan Bakker (Cyclingteam Jo Piels) and 4 seconds on Hamish Schreurs (Klein Constantia). Having spent two days in Hungary, the peloton moved north and entered Slovakian roads in Trencin region. 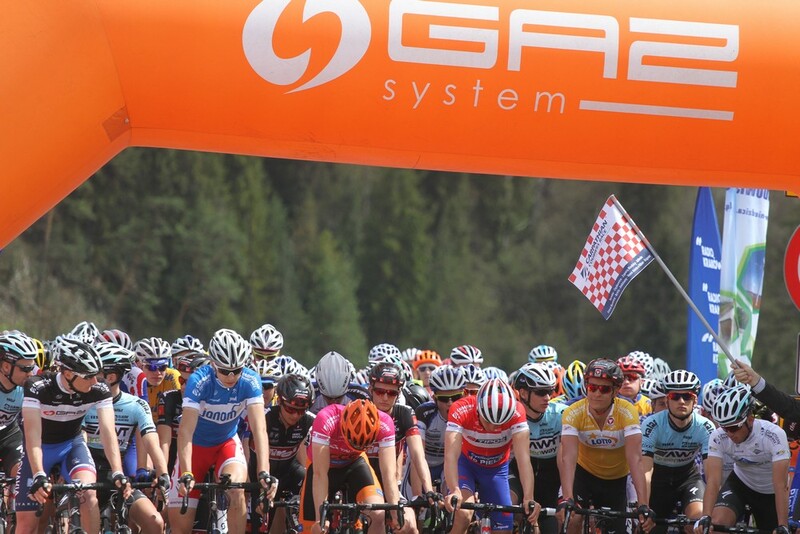 Riders set off from Trenčianske Teplice and made their way through roads of Zilina region, dealing with four categorized climbs before a quick run-down to the finish in Stara Bystrica. The day started with CCC Sprandi Polkowice and Lotto Soudal U23 teams trying to impose control on the bunch ahead of the first climb of the day – Homolka. 8km ascent averaged around 5% and saw first riders gaining advantage. Daniel Pearson (Team Wiggins) and Sebastian Schonberger (Tirol Cycling Team) attacked and were immediately joined by mountains classification leader Evgenii Koberniak (Russia) and Patryk Złotowicz (TKK Pacific Toruń). Klein Constantia riders brought the move back and Spaniard Enric Mas collected 3 points atop the climb. Koberniak saved the jersey with second place while Altopack’s Szymon Rekita took third. Mas and Koberniak also collected points atop Strazov, second climb of the day. 5km ascent temporarily stretched the peloton and as riders started descending towards Rajec, Tirol Cycling Team and CCC Sprandi paced a group of only 40 riders. A long flat section allowed more riders to rejoin the front group. The numbers came handy in the battle for podium spots at the first intermediate sprint. Race leader Stephan Bakker (Cyclingteam Jo Piels) didn’t want to leave anything to chance and outsprinted Hamish Schreurs (Klein Constantia), tightening his grip on the yellow jersey. The pace was high and none of the breakaway attempts succeeded. Italy’s Leonardo Tortomasi (Altopack) took points atop small climb of Turie but what really mattered was the final intermediate sprint. This time Schreurs played his cards right and got the bonus. Lionel Taminiaux (Color Code Arden) and Bakker crossed the line 2nd and 3rd respectively, securing their positions on the virtual podium. Final kilometers were marked by a 4km climb of Lutiska and a 7km run-down into Stara Bystrica. Team Wiggins riders – James Knox and Daniel Pearson – stormed the ascent and forced the pace with hopes of taking a stage win. They were soon joined by Kristis Neilands (Latvian National Team) but the chasing group smoothly caught up with them on the descent and a reduced peloton, marshaled by Lotto Soudal U23, entered Stara Bystrica to contest the stage win. LKT Brandenburg’s Max Kanter and Leon Rohde led the charges but were unexpectedly denied on the line by Michał Paluta (CCC Sprandi Polkowice) who brought his team yet another victory in the race. „It was a nervous stage on a demanding route. There was no major breakaway but attacks never stopped. We tried to control it a bit but with jut five riders it is really hard, especially against a quality field. We covered the most dangerous moves and stayed ocused during the day” – Polish U23 road race champion explained. 20-year-old started the day 4th overall, four seconds behind Bakker. The Dutch rider gained 4 bonus seconds at intermediate sprints and together with Schreurs and Taminiaux missed the stage podium, paving way for Paluta to take 10 seconds bonus and the jersey.